Remote tuning has been around for many years and got its start in auto racing. Mechanics looking for an edge played around with tuning engines to get every ounce of horsepower out of it. This is especially important when adding aftermarket parts. Manufactures simply can’t account for every aftermarket product on the market when they setup the car. When you are considering adding aftermarket parts like custom exhausts, cold air intake or turbochargers it is essential to look at remote tuning. Essentially, remote tuning is like stock custom tunes except you will share you car’s setup with the programmer. They will then take into account all the different parts to develop a remote tune that fits your needs. Most often, this tune with be altered to fit your needs like more horsepower or more fuel economy. Going through this process maximizes the parts you have added. Finding a remote tune for your vehicle should be more than asking your buddies. Having a tune that isn’t setup for your car can cause real damage and ultimately could cost you thousands to fix. There are many shops out there that specialize in creating these programs to help maximize your car. Check them out by doing a search and also searching forums for other people’s experiences. For example, one of the better shops around is Brooks Speed. 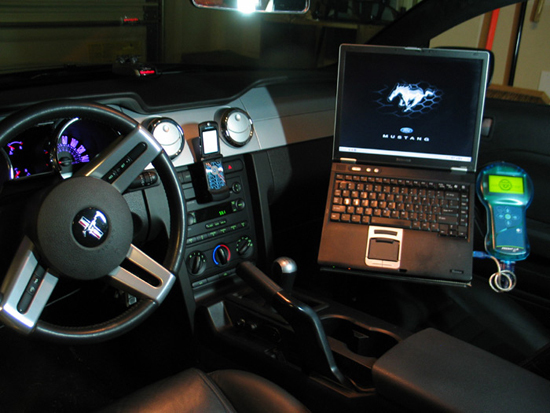 They have been tuning vehicles especially Mustangs for a long time and are experts in their field. By doing some research and finding a reputable shop, you will maximize your car performance without wasting money or damaging your engine. A remote tune along with aftermarket parts will make your vehicle stand out in the crowd. Don’t sacrifice performance, get a remote tune.